Did my best today with this sickness. This is what I got. Wish it were more. Enjoy (and apologies!)! “Anesu is the kind of person who cheats at solitaire” is a surprisingly elegant way of summing up her character. If you cheat against yourself, you don’t get angry and try to beat yourself up in an alley. 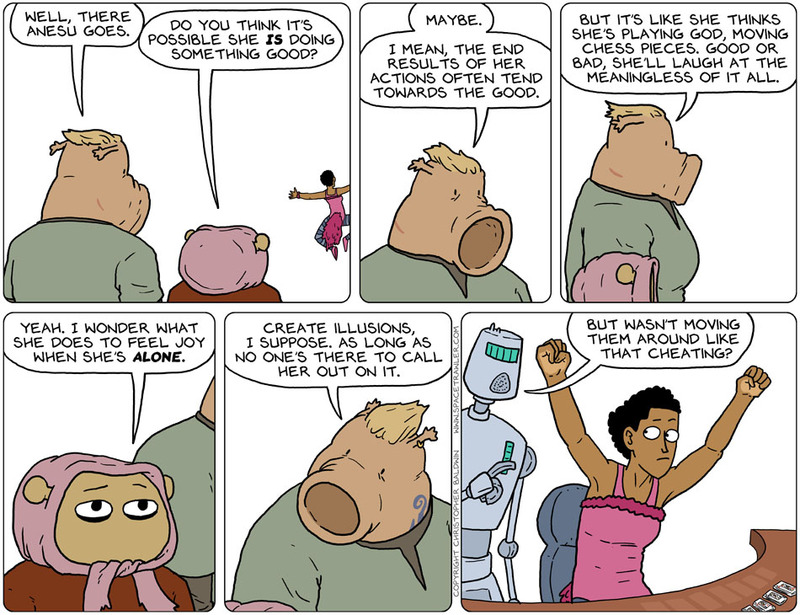 I think there is a small mistake in the speech bubble of the 3rd panel – Shouldn’t it be “meaninglessNESS”? And indeed… Cheating at solitaire *is* a pretty good way of describing Anesu’s personality. Don’t worry. Get well soon. The story is the important part, anyway. I find the blank backgrounds kind of relaxing and surreal. Like when Neo first enters the Matrix. I’m thinking of “The Spectre of the Gun.” Just hang a clock in there somewhere, and color all the backgrounds red. It’ll work. It isn’t cheating if you’re following your own rules. My good deed of the day – Teaching a bot to play solitaire.